Time to send the kiddos back to school. And we all know that when you're also sending DIABETES back to school, it's not as easy as a new bookbag and some pencils! I wanted to point you in the direction of resources that I use to get Sweets ready to school. Take a look at my School and Other Caregivers Tab above. 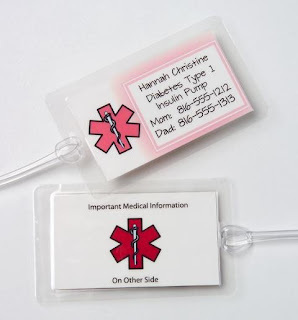 You will find links to our 504 plan, other 504 plans that might fit your situation better, pump directions, glucagon directions, items to put into a diabetes supply kit, lanyard tags (courtesy of Heidi at D-Tales), a bg flow chart, and an information sheet to give out to... well, anyone and everyone! I was doing a little web surfing last night when I got another idea! I was looking at Lauren's Hope when I landed on their tab for Backpack Tags. They were super cute! But, because I like to do a little crafting, I thought to myself. "HEY! I can do THAT!" My concern was - could I do it cheaper. Because if I can't, then I'd rather just buy one. I'm all about doing what makes the most sense. You can find these at Staples. They are $5.99 for a 5 pack. Here's the link in case you want to order online. 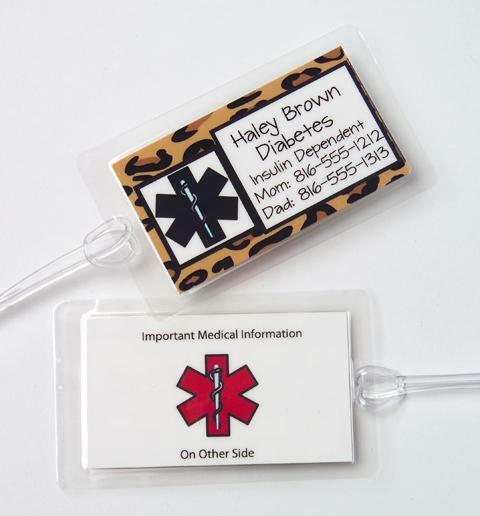 So, all you would have to do to make some of your own would be to buy the Bag Tags and get to work! The decorating would be the funnest (is that a word?) part! You could use stickers! Markers! GLITTER!!!! You could fire up the computer and make a design. If you use the business card template, I'm thinking that would be the perfect size! What you put on the tag itself is up to you! You could put your cell number. You could put "If lost, please return to..." You could put your child's name and teacher/school. You could put things like "type 1 diabetes", "wears an insulin pump", "peanut allergy", "gluten free diet". Whatever is important to you! Of course, if crafting is not your thing -- You can find some super cute tags at Lauren's Hope! I have yet to make these... but I will be working on them soon! I would like to attach one to Sweetpea's Diabetes bag. And her bookbag. And her lunch box. And probably other things that I just can't think of right now!! The possibilities are really endless! I hope you find some useful information to help you with the transition back to school (or to school for the first time!). I am by no means an expert - just someone with a little experience on both sides! Now... get your craft on and have some fun! I can't wait to see what you do with them! I've never seen this style before. How cool! 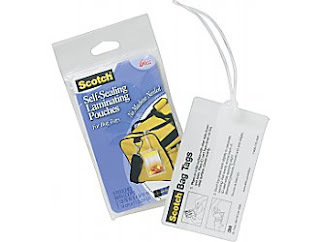 I've been thinking about backpack tags because in college, I'm guaranteed to have my backpack with me at all times. I always wear my MedicAlert bracelet, but you never know if it'll break, if the EMTs will overlook it, etc, etc, etc. 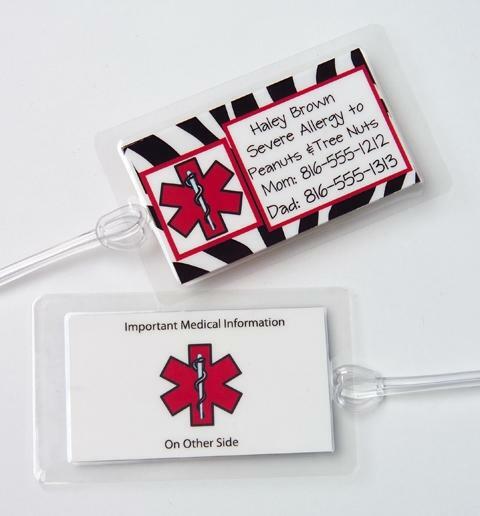 This is a great, cheap alternative to the backpack tags sold by medical alert bracelet companies! It'll have to be one of my projects for the week before school starts-DECORATING!!!! Thanks for sharing all your school info...will be looking over everyone's 504s to see how my stacks up and to make sure I haven't missed anything! UGH...why can't we just buy backpacks, crayons, pencils, scissors, etc like everyone else getting ready for school?!?! My homemade tags for Joe's lockdown bag look so Gh-etto...UGH. Great ideas Hals! I used the larger size (can't remember if they were 4x6 or 5x7) Scotch sheets to laminated a "pick and choose" carb count menu for Kate to help her at school. Love those laminating sheets! Hallie, those are the exact ones that I used last year and they worked great! They lasted the whole year and several of them are in good enough shape to re-use this year. We attach them to her backpack, lunchbox, dbag, kit in classroom. I also have a smaller one attached to her glucose meter case (since there are several T1 kiddos at her school). I may have even found them at Wal-Mart! Love the idea Hallie! I also love the carb count idea laminated!